The Concord High School Marching Band from Elkhart, Indiana provides the setting for a new book that details the triumphs and trials of the marching band experience. Author Kristen Laine immersed herself in the band for six months to gather research for American Band: Music, Dreams, and Coming of Age in the Heartland . The result is a respectful account of real-life characters whose stories are skillfully woven together. American Band follows the Concord H.S. Marching Minutemen through the entire 2004 season. The book highlights the band's challenges and triumphs as its staff and students try to defend the state championship title. The book informs readers about the band's secrets to success, but this is not simply a play-by-play manual of how to create an outstanding marching band. The story goes well beyond the daily rehearsals and into the lives of the people involved. Several students come to the forefront of the story and serve as lead characters along with band director Max Jones. The elements of hard work, dedication and teen dynamics are frequent themes of what the students are experiencing both on and off the performance field. The writing is polished and literate. 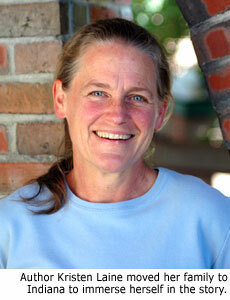 Author Kristen Laine is an award-winning journalist whose commentaries can be heard on Vermont Public Radio. Laine also has marching band experience, although the shows she performed hardly resemble today's sophisticated production. "The straight lines and 90-degree angles of my band days are long gone," Laine says. "When I was in marching band, we prepared for one month and entered a single competition." The thought of writing a book about marching band surfaced when Laine attended her twenty-fifth class reunion. "While reminiscing with high school classmates, all of us discovered how much band had meant to us," Laine says. "Band had been, in varying degrees, a surrogate family. But more than that: we also believed that band had prepared us for life better than anything else we'd done in high school, or even college. Like the others, I believed that I had a stronger work ethic, felt more confident, worked better in groups, and reached higherbecause I'd been in band." Once Laine started the project, the story evolved into a broader, deeper book than she originally imagined. "At first I assumed that I'd find an updated version of my own story, band as surrogate family," Laine says. "I found some of that, to be sure. But as I talked to the kids in the Concord band, I grew to understand that religious faith was the most important thing in many of their lives. "Immigration and the decline of manufacturing towns are other examples of issues that come up even though one wouldn't typically associate them with a book about high school students. Having a wider focus allowed me to explore issues of community and generational connection, which I think makes for a deeper story than the hermetic environment that sometimes passes for life in high school." American Band is a treat, especially for anyone who has enjoyed a connection to marching band. The project was literally years in the making, and the author and publisher have shown great dedication to deliver this story about the impact marching band has on the lives of those involved. American Band is available in hardcover (324 pages, plus eight pages of photos) and paperback. For more information about the author and the book, visit AmericanBandBook.com. Author photo by Medora Hebert.